Hyperion’s record of the month for June is an intense and enthralling musical journey of powerful Russian twentieth-century music performed by the charismatic cellist, Alban Gerhardt and highly acclaimed pianist Steven Osborne. Shostakovich’s Cello Sonata Op 40 received its premiere in December 1934, in a period of great personal turmoil. Its return to a much more conservative style did not fade his image—due to the impact of his opera Lady Macbeth of Mtensk—as the Soviet Union’s enfant terrible which had created a difficult situation against a furious Stalin and the régime. The impact of censorship on Shostakovich’s musical progress resulted in works with deeply personal and powerful statements which can be heard on this disc. His Eleven pieces for cello and piano—eight of which are recorded here—are a collection of arrangements of Shostakovich’s ballet and film compositions, the best known being the Nocturne from the film The Gadfly. 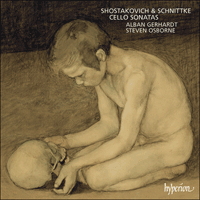 Also on this disc is Alfred Schnittke’s First Cello Sonata, in which he takes the basic major/minor third and the perfect cadence and subjects them to extreme magnification resulting in an exploration of harmony, atmosphere, drama and anguished searching. When Shostakovich’s Cello Sonata received its premiere in December 1934, many of his contemporaries were struck by its conservative language. His image as the Soviet Union’s enfant terrible had not yet faded despite his very public return to a more accessible musical language in his acclaimed opera Lady Macbeth, premiered earlier that year. Around this time Shostakovich wrote various articles describing his search for a simple, clear and expressive language. Though that search was to take him into the deeply ambivalent world of the Fourth Symphony of 1936, the Cello Sonata is clearly an early manifestation of this new trend. Right from the start, the Sonata feels like a new departure. Its gently rocking opening doesn’t sound like anything Shostakovich had written before; the very self-conscious repeat of the sonata exposition is almost a declaration of faith in Classical first principles. And, though Shostakovich had cancelled further lucrative work in film in order to concentrate on it, the Sonata is permeated with the intonations of popular music and Lady Macbeth. Instead of the yearning arioso-writing that can be heard in the contemporaneous Moderato for cello and piano, the Sonata’s Largo shows a stronger kinship with the convicts’ song that concludes the opera, echoing it strongly in its four-bar phrasing, its melodic shape and even at one point by a close allusion. In the cheekily song-like finale Shostakovich reverts to the high spirits of the previous year’s First Piano Concerto, keeping the manic spirit of music-hall only just at arm’s length. Most remarkable of all, though, is the faux-naif second-movement scherzo, with its stark, almost peasant-like roughness. At no point does it evoke Russian folk song; in fact, its heavy repeated rhythms and four-square phrases are more reminiscent of German or Austrian dances as refracted through the lens of Schubert, Brahms or Mahler. Notwithstanding all these influences, there is a distinctly urban swagger to the scherzo, suggesting that here, once again, Shostakovich the film composer is not far away. The Eleven pieces for cello and piano—three of which are omitted from this disc for reasons of length—are a collection of arrangements made by Georgiy Kirkor, Roman Sapozhnikov, S Kalianov, Levon Atovmian and Juozas Chelkauskas. Of all these arrangers, one in particular (Atovmian) was Shostakovich’s close friend, and the most prolific of all the arrangers who delved into his ballet, film and incidental music. Many of his arrangements—the four ballet suites in particular—brought income to Shostakovich at perhaps the lowest point in his career: the years 1949 to 1953 that followed his public humiliation in the 1948 clampdown on the sciences and arts. Some of these pieces are well known—those from The Gadfly, including the ‘Nocturne’, have become familiar through Atovmian’s suite, while ‘Die mechanische Puppe’ (‘The Clockwork Doll’) and ‘Drehorgel’ (‘Hurdy-Gurdy’) are known as easy piano pieces for children. But some of the other pieces are now extremely obscure: despite Shostakovich’s worldwide popularity, much of his film and incidental music is never heard. These short pieces are a timely reminder that music is not always neglected for a good reason; some of the most striking of these pieces, in fact, come from films and plays whose overtly political content might suggest poverty of inspiration. As this collection makes clear, Shostakovich had a remarkable capacity for writing genuinely fine music for otherwise undistinguished projects. The delicate ‘Clockwork Doll’ comes from Shostakovich’s birthday gift to his then nine-year-old daughter Galina: A Child’s Exercise Book Op 69 for piano. ‘Hurdy-Gurdy’ (‘Sharmanska’ in Russian) comes from Ballet Suite No 1, itself a suite assembled by Atovmian in 1949 from earlier film, ballet and incidental music. It was used again by Shostakovich in his 1952 collection of easy piano pieces, Dances of the Dolls. The Kalianov arrangement ‘Trauriges Lied’ (‘Sad Song’) is familiar from Shostakovich’s only operetta, Moskva, Cheryomushki (1958) as ‘Lyusya’s Song of Yearning’ from the Prologue, and the beautiful, Schumannesque ‘Wiegenlied’ (‘Lullaby’) comes from the now obscure concert spectacle Victorious Spring Op 72 (1945). Chelkauskas’s arrangement of the ‘Gigue’ comes from Grigoriy Kozintsev’s stage production of Hamlet (1954). Atovmian’s arrangements include music from the 1955 film The Gadfly (the ‘Nocturne’), and ‘Frühlingswalzer’ (‘Spring Waltz’) from the 1949 film Michurin. The brief Moderato for cello and piano was discovered in the State Archive of Literature and Art in 1986. The exact date of its composition is not known, since Shostakovich never counted it among his numbered works; it is thought to date from the 1930s. Its brevity suggests that it may have been intended as part of a sonata—perhaps a first-movement exposition, or the first part of a slow movement. Its intense lyricism links it strongly with Lady Macbeth, and with Katerina’s Act I aria in particular, intriguingly suggesting that there might have been an alternative Cello Sonata in Shostakovich’s mind in the mid-1930s. Alfred Schnittke’s First Cello Sonata, together with his Piano Quintet (1976), the Third Violin Concerto (1978) and the Four Hymns (1974–9), marks the start of a new phase in his musical evolution. In the audacious ‘polystylism’ of the First Symphony (1972), Schnittke had forcefully realized his intention to bring ‘light’ and ‘serious’ music together in a kaleidoscopic score that placed jazz and Viennese operetta alongside quotations from Beethoven and Haydn. But although polystylism is commonly assumed to be Schnittke’s invention, he was by no means the only Soviet composer to write in this way. In fact, as early as 1968, Arvo Pärt’s Credo, based on the C major Prelude from Book I of Bach’s Well-tempered Clavier, had thrown down a symbolic gauntlet to his contemporaries that he himself eventually responded to several years later with his pared-down tintinnabuli style, based on simple triadic harmonies. For Soviet composers, the 1970s was a decade of ‘intonational crisis’: a period when they began to question their initial embrace of the avant-garde techniques they had learned during the ’60s. And for Schnittke in particular that meant delving deeply into the nature of musical expression. He had already argued that all composers, consciously or not, had ‘hierarchies’, or ‘layers’ in their musical language, citing Mahler, Webern and Ives as examples. In his own First Symphony, Schnittke, following Mahler and Ives, had favoured a starkly juxtaposed polystylism. But only four years later the process of consolidating and refining this chaotic language began. With the Piano Quintet, composed in response to the death of his mother, Schnittke’s musical language underwent a transformation. Paradoxically, the absence of direct quotation went hand in hand with a more symbolic treatment of stylistic allusions, so that instead of quoting from a Strauss waltz, for example, Schnittke would take the most basic feature of a waltz (its repetitive bass accompaniment) and distort it, much as Shostakovich had done before him. In the First Cello Sonata, Schnittke takes two of the most basic building-blocks of tonal music—the major/ minor third and the perfect cadence—and subjects them to extreme magnification. In the opening Largo, the effect is gently melancholic, circling around C major/minor but evading the resolution of an identifiable chord. The furious scherzo is firmly in the Shostakovich mould: a whirlwind Presto constructed on rigorously contrapuntal lines that recalls the blistering fugato of the Fourth Symphony’s first movement. Here, Schnittke continues to explore the major/minor third oscillations of the Largo, transformed into multiple characters: winding chromatic thirds, the piano’s menacing bass tread and its rumbling bass quavers; the weird, slithering cello fifths and pizzicato chords over the piano’s climactic arm-cluster. The same major/minor third idea also shapes the piano’s gothic-horror-style diminished seventh chords, grotesquely suggestive of a leaden waltz. To use this chord at all by 1978 was as startling as inserting a C major triad into an atonal piece: once again, Schnittke’s treatment of over-familiar musical material is questioning and subversive. Just as he constantly undermines the major/minor triad, the diminished seventh is over-inflated and made both absurd and sinister. Underpinning it all is a carefully wrought canonic structure based on the cello’s opening material and subjected to ingenious processes of repetition and augmentation. If one feature of the Sonata is Schnittke’s obsession with small units of musical expression, then another is his striving for a kind of hyper-expressivity, even hyperbole. This too draws deeply upon Shostakovich’s sound-world; the opening cello music of the finale has the same agonized intensity as Shostakovich’s most searing string recitatives, with its fixated semitonal rocking back and forth and painfully over-stretched melodic leaps. Where the earlier Piano Quintet had ended in a radiantly serene D flat major, this Largo rejects the possibility of any such clear resolution. Instead, Schnittke uses memory, not harmony, to create closure: he returns to the main motif of the first movement (the bell-like falling piano chords), to its superimposed major/minor chords and to the Presto’s ascending cello figure, transformed from an assertive fortissimo to pianissimo. Over the plainest of accompaniments—simple sustained piano chords—the cello muses on its opening rocking figure and on the piano’s falling bell-chord motif. Ambiguity persists to the very last bars: below the piano’s whispered recollection of the Presto, the cello’s sustained C is tinged with C sharp and an F sharp harmonic. It is Schnittke’s simultaneous avoidance of resolution and constant allusion to it that create an eerie sense of wandering through once-beautiful, now desolate, ruins. In fact, the melancholic nature of this music is almost its raison d’être; without the unlocking of Schnittke’s melancholic side in the Quintet, it could be argued that the mature mastery of his works from the late 1970s could not otherwise have been achieved. By 1991, his health failing after a severe stroke, Schnittke’s music became increasingly dark and introspective. The playful stylization of the early Concerti Grossi was a decade behind him, and works from his last years (1991–8) have not to date achieved the popularity of those from the 1970s and ’80s. The Madrigal In Memoriam Oleg Kagan (1991), written in homage to the violinist who had premiered many of Schnittke’s works and who had recently died, is intensely private, to the point where the listener can feel they are eavesdropping upon a dark, grieving monologue. Its cello-writing is improvisatory and spare, not admitting even a suggestion of the religious faith that had illuminated so much of Schnittke’s earlier work. By contrast, Klingende Buchstaben (‘Sounding Letters’, 1988) had a much happier genesis. Written as an affectionate fortieth birthday tribute to the cellist Alexander Ivashkin, it is based on letters from the name ‘Alexander’: A–E–A–D–E. More flamboyantly gestural than the Madrigal, Klingende Buchstaben nevertheless shares its mournful, soliloquizing tone, ending ambiguously not on the fourth or fifth suggested by the A–E–A–D–E monogram but hovering around the interval of a tritone. À sa création, en décembre 1934, la Sonate pour violoncelle de Chostakovitch frappa par son langage conservateur. Le compositeur restait l’enfant terrible de l’Union Soviétique, malgré un retour très populaire à un langage musical plus accessible dans son opéra à succés Lady Macbeth, créé un peu plus tôt cette année-là. Vers la même époque, il écrivit divers articles pour dépeindre sa quête d’une langue simple, claire et expressive, dont la Sonate pour violoncelle est à l’évidence une manifestation précoce—même si cette nouvelle tendance devait l’entraîner dans l’univers profondément ambivalent de la Symphonie no 4 (1936). D’emblée, la Sonate s’apparente à un nouveau départ. Son ouverture doucement berçante ne ressemble à rien de ce que Chostakovitch a écrit jusque là: la répétition très appuyée de l’exposition de la Sonate sonne presque comme une déclaration de foi dans les grands principes classiques. Et Chostakovitch avait beau avoir annulé de lucratives musiques de films pour se consacrer à elle, cette sonate est imprégnée d’intonations de musique populaire et de Lady Macbeth. À l’écriture arioso languissante du Moderato contemporain pour violoncelle et piano, le Largo de la sonate préfère une parenté avec le chant du forçat qui conclut l’opéra, comme l’attestent son phrasé de quatre mesures, son modèle mélodique et même une allusion directe. Dans le finale effrontément chantant, Chostakovitch retrouve la pétulance du Concerto pour piano no 1 de l’année passée—le fol esprit du music-hall n’est jamais bien loin—, même si le moment le plus remarquable est le scherzo du deuxième mouvement, faussement naïf, avec sa rudesse âpre, presque paysanne, mais sans jamais évoquer les chants populaires russes: en réalité, ses lourds rythmes répétés et ses phrases carrées rappellent plus les danses allemandes ou autrichiennes passées par le prisme de Schubert, de Brahms ou de Mahler. Toutes ces influences n’empêchent pas une fanfaronnade nettement urbaine, preuve que, là encore, le compositeur de musiques de films n’est pas loin. Les Onze pièces pour violoncelle et piano—dont huit figurent sur ce disque—sont des arrangements réalisés par Georgiy Kirkor, Roman Sapozhnikov, S. Kalianov, Levon Atovmian et Juozas Chelkauskas. Atovmian, le plus prolifique des cinq, étudia en profondeur la musique de ballet, de film et de scène de Chostakovitch, dont il était par ailleurs un ami intime. Nombre de ses arrangements (notamment les quatre suites de ballet) procurèrent des revenus à Chostakovitch au plus bas de sa carrière, dans les années 1949–1953, juste après son humiliation publique pendant la répression qui, en 1948, frappa les sciences et les arts. Certaines de ces pièces sont bien connues, que ce soit à travers la suite d’Atovmian (cf. les pièces extraites de Le Taon, notamment le «Nocturne») ou comme morceaux de piano faciles à l’usage des enfants (cf. «Die mechanische Puppe» [«La poupée mécanique»] et «Drehorgel» [«Orgue de Barbarie»]). Mais d’autres sont aujourd’hui fort obscures: malgré la popularité universelle de Chostakovitch, on n’entend plus guère ses musiques de film et de scène. Ces petites pages nous rappellent que la musique n’est pas toujours oubliée à bon escient. En fait, certaines des œuvres les plus saisissantes proviennent de films et de pièces de théâtre dont le contenu ouvertement politique pouvait laisser craindre une certaine pauvreté d’inspiration. Mais, comme le montre bien ce recueil, Chostakovitch avait une remarquable aptitude à écrire une musique authentiquement belle pour des projets par ailleurs quelconques. La délicate «Poupée mécanique» est tirée du cadeau d’anniversaire que Chostakovitch offrit à sa fille Galina pour ses neuf ans: un Cahier d’enfant op. 69 pour piano. «Orgue de Barbarie» («Sharmanska» en russe) est extrait de la Suite de ballet no 1, elle-même façonnée par Atovmian à partir d’une musique de film, de ballet et de scène (1949)—une œuvre que Chostakovitch inclut dans «Danses de poupées» (1952), recueil de morceaux de piano enfantins. L’arrangement de Kalianov «Trauriges Lied» («Chant triste») est connu car il reprend le «Chant languissant de Lyusya», extrait du Prologue de l’unique opérette de Chostakovitch: Moscou, Tchériomouchki (1952); le beau et schumannesque «Wiegenlied» («Berceuse») provient, lui, d’un spectacle de concert aujourd’hui oublié: La Victoire du printemps, op. 72 (1945). Quant à la «Gigue» arrangée par Chelkauskas, elle est extraite de la pièce Hamlet (1954) de Grigoriy Kozintsev. Atovmian arrangea notamment la musique du film de 1955 Le Taon (le «Nocturne») et «Frühlingswalzer», la «Valse du printemps» tirée du film Mitchourine (1949). On ignore de quand date exactement le bref Moderato pour violoncelle et piano découvert aux State Archive of Literature and Art en 1986—Chostakovitch ne le compta jamais parmi ses œuvres numérotées—, mais il remonte probablement aux années 1930. À en juger par sa brièveté, il a d’abord pu être conçu comme un morceau de sonate—peut-être l’exposition d’un premier mouvement ou la première partie d’un mouvement lent. Son lyrisme intense le rattache fortement à Lady Macbeth (aria de Katerina, acte I), laissant curieusement penser que Chostakovitch a pu songer à une autre sonate pour violoncelle au milieu des années 1930. Avec le Quintette avec piano (1976), le Concerto pour violon no 3 (1978) et les Quatre hymnes (1974–9), la Sonate pour violoncelle no 1 marque le début d’une nouvelle phase dans l’évolution musicale de Schnittke. Grâce à son audacieux polystylisme, la Symphonie no 1 (1972) avait permis au compositeur de réunir avec force des musiques «légère» et «sérieuse» dans une partition kaléidoscopique où se côtoient jazz, opérette viennoise, citations beethnovéniennes et haydniennes. Mais s’il est généralement considéré comme le père du polystylisme, Schnittke ne fut en rien le seul compositeur soviétique à écrire de la sorte. En fait, dès 1968, Arvo Pärt, avec son Credo fondé sur le Prélude en ut majeur du Livre I du Clavier bien tempéré de Bach, avait jeté un gant symbolique à ses contemporains—un défi qu’il avait d’ailleurs fini par relever lui-même, quelques années plus tard, avec le style minimaliste de ses tintinnabuli, reposant sur de simples harmonies triadiques. Pour les compositeurs soviétiques, les années 1970 furent une décennie de «crise intonational», une période où ils commencèrent à remettre en question leur adoption des techniques avant-gardistes apprises dans les années 1960. Ce qui, chez Schnittke, se traduisit par une étude en profondeur de la nature de l’expression musicale. Il avait déjà avancé que tous les compositeurs avaient, consciemment ou non, des «hiérarchies» ou des «strates» dans leur langage musical, avec pour exemples Webern, Mahler et Ives—deux compositeurs à l’image desquels il avait opté, dans sa Symphonie no 1, pour un polystylisme nettement juxtaposé. Ce fut seulement quatre ans plus tard que commença le processus de consolidation et d’épuration de ce langage chaotique. Avec le Quintette avec piano, composé en réaction à la mort de sa mère, Schnittke métamorphosa sa langue musicale. Paradoxalement, l’absence de citation directe alla de paire avec un traitement davantage symbolique des allusions stylistiques, en sorte qu’au lieu de citer une valse de Strauss, par exemple, Schnittke prenait la caractéristique la plus élémentaire d’une valse (son monotone accompagnement à la basse) et la distordait, comme Chostakovitch l’avait fait avant lui. Dans sa Sonate pour violoncelle no 1, Schnittke prend deux blocs de construction parmi les plus basiques de la musique tonale (la tierce majeure/ mineure et la cadence parfaite), qu’il sublime. Dans le Largo initial, l’effet, doucement mélancolique, tournoie autour d’ut majeur/mineur mais élude la résolution d’un accord identifiable. Le scherzo, furieux, est dans la droite ligne de Chostakovitch: un presto éclair appuyé sur des lignes rigoureusement contrapuntiques rappelle le fugato cinglant du premier mouvement de la Symphonie no 4. Ici, Schnittke explore plus avant les oscillations des tierces majeures/mineures du Largo, démultipliées: tierces chromatiques ondoyantes, démarche menaçante de la basse au piano, avec ses roulements de croches; mystérieuses quintes violoncellistiques ondulantes et accords en pizzicato par-dessus le paroxystique cluster du bras, au piano. La même idée de tierce majeure/mineure façonne les accords de septième diminuée, de style «gothique-horreur», grotesquement évocatrice d’une valse de plomb. Utiliser cet accord en 1978 était aussi saisissant qu’insérer un accord parfait d’ut majeur dans une pièce atonale: là encore, le traitement que Schnittke fait subir à un matériau musical plus que familier est source d’interrogation et de subversion. Alors qu’il sape constamment l’accord parfait majeur/mineur, la septième diminuée est gonflée à l’excès et rendue absurde, sinistre. L’ensemble est soutenu par une structure canonique minutieusement ciselée, fondée sur le matériau violoncellistique initial et soumise à d’ingénieux procédés de répétition et d’augmentation. La Sonate est marquée tout à la fois par l’obsession de Schnittke pour les petites unités d’expression musicale et par son aspiration à une manière d’hyperexpressivité, voire d’hyperbole—deux caractéristiques qui plongent aussi leurs racines dans l’univers sonore de Chostakovitch: la musique violoncellistique d’ouverture du finale a la même intensité angoissée que la plupart des fulgurants récitatifs pour cordes de ce compositeur (bercement semi-tonal fixe et sauts mélodiques rigoureusement étirés). Là où le Quintette avec piano s’achevait dans un ré bémol majeur d’une sérénité radieuse, le présent Largo exclut toute possibilité d’une résolution aussi limpide. Schnittke utilise le souvenir, et non l’harmonie, pour forger sa conclusion: il retourne au motif principal du premier mouvement (les accords pianistiques descendants carillonnants), à ses accords surimposés majeur/mineur, et à la figure violoncellistique ascendante du Presto, transformation d’un fortissimo affirmatif en pianissimo. Par-dessus un accompagnement des moins complexes—de simples accords tenus au piano—, le violoncelle rêvasse à sa figure berçante initiale et au motif en accords carillonnants descendants du piano. L’ambiguïté persiste jusqu’aux toutes dernières mesures; sous le souvenir pianistique murmuré du Presto, l’ut tenu du violoncelle est teinté d’harmoniques en ut dièse et en fa dièse. C’est la simultanéité de l’évitement de la résolution et de la constante allusion à cette même résolution qui crée un curieux sentiment d’errance à travers des ruines jadis belles, aujourd’hui désolées. En fait, la mélancolie est presque la raison d’être de cette musique et l’on pourrait croire que jamais la maîtrise aboutie des œuvres de la fin des années 1970 n’aurait pu se faire sans la révélation de cette même mélancolie dans le Quintette. En 1991, Schnittke, à la santé déclinante après une grave attaque, composa une musique de plus en plus sombre et introspective. La stylisation enjouée des premiers Concerti Grossi avait déjà dix ans, et les œuvres de ses dernières années (1991–8) n’ont pas eu la popularité de celles des années 1970 et 1980. Le Madrigal In Memoriam Oleg Kagan (1991), écrit en hommage au violoniste qui avait créé nombre des œuvres de Schnittke et qui venait juste de mourir, est intensément intime, au point que l’auditeur se sent l’espion indiscret d’un monologue sombre, douloureux. L’écriture violoncellistique, de type improvisé et parcimonieuse, n’admet pas la moindre évocation de la foi religieuse qui avait si souvent illuminé les œuvres de Schnittke. Par contraste, Klingende Buchstaben («Lettres sonores», 1988) eut une genèse bien plus heureuse. Composée en hommage affectueux pour le quarantième anniversaire du violoncelliste Alexander Ivashkin, cette pièce repose sur les lettres d’«Alexander»: A–E–A–D–E (la–mi–la–ré–mi). Malgré un geste plus flamboyant, Klingende Buchstaben est tout aussi lugubre, soliloquant, que le Madrigal et s’achève sans ambiguïté sur la quarte ou la quinte suggérée par le monogramme A–E–A–D–E, mais en hésitant entre les intervalles d’un triton. Von Anfang an spürt man, dass die Sonate ein neues Kapitel einleitet. Ihre sanft wiegende Einleitung lässt sich mit nichts anderem aus Schostakowitsch’ bisher Komponierten vergleichen. Die sehr selbstbewusste Wiederholung der Sonatenexposition wirkt fast wie ein Glaubensbekenntnis an die Grundprinzipien der Klassik. Obwohl Schostakowitsch mit seiner Ablehnung lukrativer Filmmusikaufträge und seiner Konzentration auf die Sonate anzudeuten schien, dass er ein schwergewichtiges und emotional tiefschürfendes Werk zu komponieren gedachte, hört man im gesamten Werk Anklänge an volkstümliche Musik und den leichteren Ton aus Lady Macbeth. Statt des sehnsuchtsvollen Arioso-Stils, dem man in dem gleichzeitig entstandenen Moderato für Violoncello und Klavier begegnet, weist das Largo der Sonate eine stärkere Ähnlichkeit mit dem die Oper beschließenden Lied der Gefangenen auf. Beiden ist eine viertaktige Phrasierung und gewisse melodische Gestalt gemein, und an einer Stelle spielt das Largo sogar direkt auf das Gefangenenlied an. In dem frech liedhaften Schlusssatz kehrt Schostakowitsch zu der guten Laune aus dem im Jahr zuvor entstandenen 1. Klavierkonzert zurück, wobei er sich der manischen Stimmung eines Varieteetheaters nur mit Mühe enthalten kann. Am bemerkenswertesten ist jedoch der scheinbar naive zweite Satz, ein Scherzo, mit seiner steifen, fast bäuerlichen Ungeschliffenheit. Nirgends klingt es nach russischem Volkslied. Die schwerfälligen wiederholten Rhythmen und vierkantigen Phrasen erinnern eher an deutsche oder österreichische Tänze, gebrochen im musikalischen Prisma eines Schuberts, Brahms oder Mahlers. Trotz dieser Einflüsse zeichnet sich das Scherzo durch einen deutlich städtischen Zug aus, der einmal mehr bezeugt, dass der Filmmusikkomponist Schostakowitsch seine Hand im Spiel hatte. Die Elf Stücke für Violoncello und Klavier—von denen acht auf dieser CD aufgenommen wurden—sind eine Sammlung von Bearbeitungen von Georgi Kirkor, Roman Saposchnikow, S. Kalianow, Lew Atowmian und J. Tschelkauskas. Atowmian war ein besonders enger Freund von Schostakowitsch, und unter den genannten Komponisten bearbeitete er die meisten Werke des Meisters, wobei er sich auf dessen Ballette, Film- und Schauspielmusiken konzentrierte. Viele seiner Bearbeitungen—allen voran die vier Ballettsuiten—schufen für Schostakowitsch ein Einkommen, das besonders in seiner vielleicht schwierigsten Zeit willkommen war: die Jahre zwischen 1949 und 1953, also die Jahre nach seiner öffentlichen Zurechtweisung 1948, als man in der Wissenschaft und Kunst scharf durchzugreifen begann. Einige der hier vorgestellten Stücke sind weithin bekannt. Die Stücke aus der Hornisse, wie unter anderem das „Nocturne“, kennt man aus Atowmians Suite, während „Die mechanische Puppe“ und die „Drehorgel“ als leichte Klavierstücke für Kinder Verbreitung gefunden haben. Einige der anderen Stücke sind jedoch völlig unbekannt. Trotz Schostakowitsch’ weltweiten Ruhmes bleibt ein Großteil seiner Film- und Schauspielmusik ungehört. Die auf dieser CD aufgenommenen kurzen Stücke erinnern uns daran, und das zur rechten Zeit, dass Musik nicht immer zu Recht in Vergessenheit gerät. Einige der beeindruckendsten Nummern kommen tatsächlich aus Filmen und Bühnenwerken, deren verschärft politischer Inhalt einen Mangel an Inspiration vermuten lässt. Die Elf Stücke für Violoncello und Klavier verdeutlichen, dass Schostakowitsch über ein erstaunliches Talent verfügte, wirklich feine Musik für ansonsten belanglose Projekte zu komponieren. Die delikate „Mechanische Puppe“ stammt aus Schostakowitsch’ Geburtstagsgeschenk für seine neunjährige Tochter Galina, dem Notenbuch eines Kindes op. 69 für Klavier. Die „Drehorgel“ („Scharmanska“ auf Russisch) ist der Ballettsuite Nr. 1 entnommen, die 1949 von Atowmian aus Schostakowitsch’ Film-, Ballett- und Schauspielmusiken zusammengestellt worden war. Schostakowitsch nahm die „Drehorgel“ später in seine Sammlung leichter Klavierstücke von 1952 mit dem Titel Puppentänze auf. Kalianows Bearbeitung, „Trauriges Lied“, kennt man schon als „Ljusjas Lied der Sehnsucht“ aus dem Prolog zu Schostakowitsch’ einziger Operette, Moskau, Tscherjomuschki (1958), und das wunderschöne Schumann-ähnliche „Wiegenlied“ hat seinen Ursprung in dem nunmehr verschollenen Konzertspektakel Siegreicher Frühling, op. 72 (1945). Tschelkauskas’ Bearbeitung der Gigue beruht auf einer Nummer aus der Bühnenmusik zu Grigori Kosinzews Inszenierung des Hamlet (1954). Zu den Atowmian-Bearbeitungen gehören das „Nocturne“ aus dem Film Hornisse von 1955 und der „Frühlingswalzer“ aus dem Film Mitschurin (1949). Das kurze Moderato für Violoncello und Klavier wurde 1986 im Russischen Staatsarchiv für Literatur und Kunst entdeckt. Das genaue Kompositionsdatum ist unbekannt, weil Schostakowitsch dieses Werk nie in seine nummerierte Werkliste aufgenommen hatte. Man glaubt allerdings, dass das Moderato in den 1930er Jahren entstand. Wegen der Kürze des Stückes fragt man sich, ob es als Teil einer Sonate gedacht war—vielleicht als Exposition des ersten Satzes oder als erster Teil eines langsamen Satzes. Die betonte Lyrik verbindet das Moderato stark mit Lady Macbeth, besonders mit Katerinas Arie aus dem ersten Akt. Ob Schostakowitsch in der Mitte der dreißiger Jahre wirklich über eine zweite Violoncellosonate nachgedacht hat, ist eine spannende Frage. Alfred Schnittkes 1. Violoncellosonate markiert zusammen mit dessen Klavierquintett (1976), dem 3. Violinkonzert (1978) und den 4 Hymnen (1974–1979) den Beginn einer neuen Phase in der musikalischen Entwicklung des Komponisten. In der unverfrorenen „Polystilistik“ der 1. Sinfonie (1972) hatte Schnittke mit Gewalt seine Absicht verwirklicht, „leichte“ und „ernste“ Musik in einer kaleidoskopischen Partitur zusammenzubringen, in der Jazz neben Wiener Operette und Zitaten von Beethoven und Haydn steht. Zwar wird allgemein angenommen, die Polystilistik sei von Schnittke erfunden worden, tatsächlich war er aber bei weitem nicht der einzige sowjetische Komponist, der auf diese Weise komponierte. Schon 1968 hatte Arvo Pärts Credo, das auf dem C-Dur-Präludium aus dem 1. Band des Wohltemperierten Klaviers von Bach beruht, seine Zeitgenossen herausgefordert, eine Herausforderung, auf die Pärt selber einige Jahre später mit seinem ausgesparten, auf einfachen Dreiklängen beruhenden Tintinnabuli-Stil reagierte. Für sowjetische Komponisten waren die 1970er Jahre ein Jahrzehnt der „Intonationskrise“, eine Periode, als sie begannen, ihre Verwendung der in den 1960er Jahren erlernten Avantgarde-Techniken infrage zu stellen. Besonders für Schnittke bedeutete das ein intensives Vertiefen in die Natur des musikalischen Ausdrucks. Er hatte schon zuvor behauptet, dass alle Komponisten in ihren musikalischen Werken, ob nun bewusst oder unbewusst, „Hierarchien“ oder „Schichten“ schufen, und bezog sich dabei auf Mahler, Webern und Ives als Beispiele. Mahler und Ives folgend bediente sich Schnittke in seiner 1. Sinfonie einer extrem vielschichtigen Polystilistik. Aber nur vier Jahre später begann der Prozess der Konsolidierung und des Feinschliffs seines chaotischen Kompositionsansatzes. Mit dem als Reaktion auf den Tod seiner Mutter komponierten Klavierquintett begann in Schnittkes musikalischer Sprache ein Umwandlungsprozess. Paradoxerweise ging das Ausblenden direkter Zitate Hand in Hand mit einer verstärkt symbolischen Behandlung stilistischer Anspielungen. Zum Beispiel nahm Schnittke anstelle eines Strauss-Walzerzitats ein Grundelement eines Walzers (seine monotone Begleitung im Bass) und verzerrte es, wie es mehr oder weniger schon Schostakowitsch vor ihm getan hatte. In der 1. Violoncellosonate isoliert Schnittke zwei der einfachsten Grundelemente tonaler Musik—die Dur- und Mollterz und die vollständige Kadenz—und setzt sie einer extremen Erweiterung aus. Im einleitenden Largo führt das zu einer sanft melancholischen Stimmung, die zwischen C-Dur und c-Moll schwankt. Eine Auflösung zu einer eindeutigen Tonart wird allerdings vermieden. Im furiosen Scherzo folgt Schnittke Schostakowitsch eng auf dem Fuße: Dieser Satz ist ein aus strengen Kontrapunktlinien konstruiertes wirbelndes Presto, das das glühende Fugato aus dem ersten Satz der 4. Sinfonie in Erinnerung ruft. Hier erkundet Schnittke weiter das im Largo begonnene Oszillieren zwischen Dur- und Mollterzen und verleiht ihm unterschiedliche Charaktere. Einmal erscheint dieses Oszillieren in Form von sich schlängelnden chromatischen Terzen, ein andermal als bedrohliche Schritte und rumorende Achtel im Bassregister des Klaviers. Dann wiederum erklingt es in Form von aalglatten Quinten auf dem Violoncello und auf dem Höhepunkt als pizzicato artikulierte Akkorde über den mit dem Arm zu spielenden Klavierclustern. Der gleiche Dur-Mollterz-Gedanke bestimmt auch die nach gotischem Horrorgenre klingenden verminderten Septakkorde des Klaviers, die auf groteske Art und Weise an einen bleiernen Walzer erinnern. Die Verwendung eines solchen Akkords 1978 war genauso verwunderlich wie der Einsatz eines C-Dur-Dreiklangs in einem atonalen Stück. Wiederum ist Schnittkes Behandlung allzu vertrauten musikalischen Materials hinterfragend und subversiv. Die gleiche Brechung, die Schnittke mit den Dur-Moll-Dreiklängen zu erreichen versucht, wird mit dem übertriebenen Einsatz der verminderten Septakkorde verfolgt, die auf diese Weise absurd und unheilvoll klingen. Untermauert wird das Ganze durch eine sorgfältig ausgearbeitete Kanonstruktur, die auf dem einleitenden Material des Violoncellos beruht, das einem einfallsreichen Prozess aus Wiederholung und Augmentation unterzogen wird. Eine Eigenschaft der Sonate mag wirklich Schnittkes Besessenheit mit kleinen Einheiten musikalischen Ausdrucks sein. Eine andere ist dann sicher sein Bemühen um eine Art Hyperexpressivität, fast schon Hyperbel. Auch das ist Schostakowitsch’ Klangwelt stark verschuldet. Die einleitende Violoncellomusik im Schlusssatz mit ihrem starrsinnigen Halbtonschaukeln hin und her und den schmerzlichen übergroßen melodischen Sprüngen verfügt über die gleiche verzweifelte Intensität wie Schostakowitsch’ ergreifende Streicherrezitative. Wo das zuvor entstandene Klavierquintett in einem leuchtend ausgeglichenen Des-Dur endete, verweigert dieses Largo die Möglichkeit einer solch klaren Lösung. Stattdessen verwendet Schnittke Erinnerung, nicht Harmonie, um einen Abschluss zu erzielen: Er kehrt zum Hauptmotiv des ersten Satzes zurück (die glockenartigen fallenden Klavierakkorde), zu seinen übereinander gestapelten Dur- und Mollakkorden und zur aufsteigenden Cellofigur des Prestos, das an dieser Stelle von einem selbstbewussten Fortissimo in ein Pianissimo verwandelt wurde. Über einer äußerst simplen Begleitung—einfache ausgehaltene Klavierakkorde—meditiert das Cello über seine Schaukelgeste vom Anfang und die fallenden Glockenakkorde des Klaviers. Vieldeutigkeit herrscht bis zum allerletzten Takt: Unter den flüsternden Erinnerungen des Klaviers an das Presto wird das ausgehaltene C des Violoncellos von einem Flageolett-Cis und Fis gefärbt. Schnittke vermeidet eine Auflösung, hält aber gleichzeitig die Möglichkeit einer solchen offen. Das schafft ein unheimliches Gefühl des Wanderns durch eine ehemals schöne Landschaft, die nun verlassen ist und in Trümmern liegt. Eigentlich ist die melancholische Art dieser Musik fast ihr Berechtigungsgrund. Man könnte behaupten, dass Schnittke, hätte er nicht seine melancholische Seite in seinem Quintett geöffnet, nie zu der reifen Meisterschaft in seinen Werken seit den späten 1970er Jahren gelangt wäre. Nach seinem schweren Schlaganfall 1991 war Schnittkes Gesundheit sehr angeschlagen, und seine Musik wurde zunehmend dunkler und nach innen gewandt. Die spielerische Stilisierung der frühen Concerti Grossi lag ein Jahrzehnt zurück. Die Werke aus seinen letzten Jahren (1991–1998) erfreuen sich bis heute noch nicht der gleichen Beliebtheit wie die aus den 1970er und 1980er Jahren. Im Madrigal In Memoriam Oleg Kagan (1991), das zum Andenken an den Violinisten entstand, der viele Werke Schnittkes uraufgeführt hatte und kurz zuvor verstorben war, erklingt eine außergewöhnlich verinnerlichte Musik, die so persönlich ist, dass der Hörer den Eindruck bekommt, er würde einen dunklen, trauernden Monolog überhören. Die Violoncellostimme wirkt improvisierend und ist ausgespart. Nicht einen Moment hört man Anklänge an den religiösen Glauben, der so viele frühere Werke Schnittkes durchzogen hatte. Im Gegensatz zum Madrigal hatten die Klingenden Buchstaben (1988) eine viel angenehmere Entstehungsgeschichte. Das Stück wurde als Geschenk zum 40. Geburtstag des Cellisten Alexander Iwaschkin geschrieben und beruht auf den verwendbaren Buchstaben des Namens „Alexander“: A–E–A–D–E. Zwar unterscheiden sich die Klingenden Buchstaben von dem Madrigal durch ihre extravaganteren Gesten, gemeinsam ist ihnen jedoch der trauernde, monologisierende Ton. Die Klingenden Buchstaben enden merkwürdigerweise nicht auf der im Monogramm A–E–A–D–E vorgegebenen Quarte und Quinte, sondern schweben auf einem Tritonus zwischen diesen beiden Intervallen.